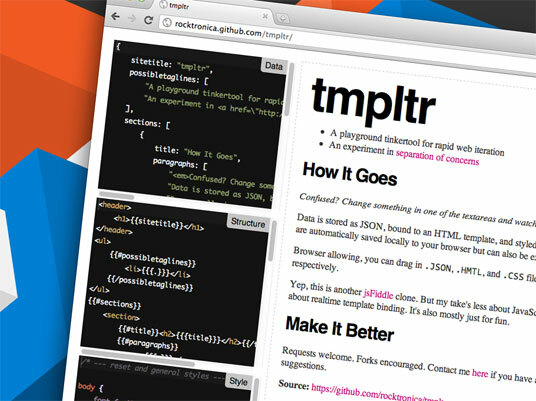 tl;dr: tmpltr is a jsFiddle clone for realtime JSON templating. Making content for the internet is not too different from, say, building a home. You can similarly compartmentalize a website. Take the page of my site that shows this blog post as an example. In both examples, the three components serve different purposes but combine to make the final product. This is called separation of concerns, and it’s a handy consideration for efficiency and keeping your brain working well. Within the web development context, tmpltr is my attempt to streamline the process of combining and iterating on those three things, where data is JSON, structure is HTML with mustache templating, and style is plain old CSS. It is a realtime and auto-refreshing internet sandbox, akin to a handful of other tools. It stands with reverence on the shoulders of its predecessors, mustache, and the ACE project. It’s also mostly just for fun. Now, because there’s nothing server-side, the form has to submit with GET instead of POST, with all the data as parameters in the URL. tmpltr will restore state from those params and, if the browser allows, clean the URL back to its default state, as if the form had submited with POST. It’s a pretty fun exercise but has its shortcomings. IE doesn’t fully support data URIs and all browsers have different length limits on what they’ll allow. All updates are also saved locally to the browser with localStorage as you type. You can work on something, close the browser, restart your computer, and it’ll still be there when you get back to it. This is an awesome technique for any kind of form and ought to be the poster child for progressive enhancement. In Chrome or Firefox, you can drag .JSON, .HTML, and/or .CSS files into tmpltr to load them into their respective inputs. The browser API isn’t very intuitive, but it’s shocking how few lines of code are needed to read files natively in the browser. All good browsers will understand that div[role="input"] is a CSS selector but few of them will allow more arbitrary properties like div[view="split"]. Github pages don’t like folders that start with _, even if you think it looks cooler that way. 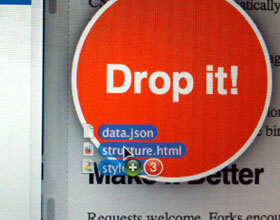 Turns out _subfolders can be enabled by disabling Jekyll. Lesson learned! You can exclude Google Analytics via cookie, and you can set that conditionally with a URL param. 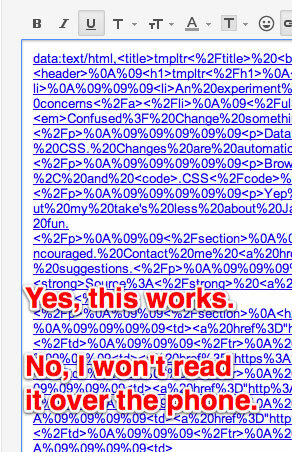 HTML5 apps are inherently bad at SEO. Verify your meta and add some hidable static HTML to be 100% sure. Non-essential CSS3 stuff is well served by Lea Verou’s Prefix Free project. If it’s non-non-essential and can’t stand a FUOC, you may be relying too heavily on CSS3. CSS media queries for resizing the inputs for bigger windows. Pretty quick and dirty. Browsers will automatically inject the presumable elements into dynamically created iFrames w/o a src attribute, and, since there’re no cross-domain restrictions here, you can shimmy down the DOM and get whatever you need. I think this is a fun little project and I’m proud of how it turned out. If you have any questions or requests, let me know. Better yet, fork it on Github and add it yourself. I would very much like some community involvement on it. Admittedly, also, I may have spent almost as much time with this blog post trying to explain what tmpltr does as I did programming it. Not really. Pretty dang close though. Hi! Wonderful idea, as it really makes the whole separation of concerns very clear, even with just a glance at the page. I was wondering if the idea was only to be able to build out the HTML and CSS, and see how it will render the JSON data provided, or is this also a way to learn and play with the templating engine? Any chance that the template engine can be plugable? This would allow one to play with the features of the different engines in the same easy manner. Great question. Its intent was mostly as a dev tool for me, but I’d be pretty happy if people found it as instructional as it is helpful. I did see one guy compare it to XSLT, so there is some promise there. Handlebars.js has been requested a couple times as another engine. We’ll see how that goes. Thank you, greatest resource, congratulations!! !